IMAN’s Green Reentry Project is an innovative social venture that showcases a multifaceted approach to addressing the entrenched and connected nature of issues facing urban communities. In particular, the Green Reentry Project recognizes that issues such as lack of decent housing, job skills, public safety, and effective reentry programs are all connected and that effective solutions to any of these challenges must address these connections. The Green Reentry Project, funded by the City of Chicago, was launched at the beginning of 2010 and seeks to convert vacant/foreclosed and vandalized properties within the Chicago Lawn Community into vibrant, environmentally sound (green) transition housing. IMAN is using the renovation of these homes to provide on-the-job training for formerly incarcerated individuals and the completed homes to provide housing for individuals reentering society. 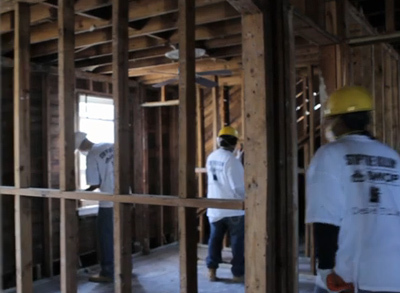 Once the green renovation of the first home is complete, several of the Project Restore members who worked on the renovation will move into it. These men will, then, have a green home to live in, job skills that are in demand, and, most importantly, a sense of ownership and belongingness to their community. In other words, these men will become the assets to their community that they always had the potential to be. IMAN’s Project Restore is based on this deeply held idea that many within the formerly incarcerated community could, with resources and the right opportunity, restore a sense of self, family and community through a successful reentry effort. The plans to acquire the second property are already underway and renovation work should begin by early spring next year. Several options are under consideration, such as a larger property with more dwellings and commercial space, or another bungalow. Whatever the exact details of the second phase, it is sure to continue IMAN’s commitment to create innovative and effective solutions to the challenges of the inner-city. This entry was posted in Direct Services and tagged Green Reentry Project by Haroon Najam. Bookmark the permalink.